Over 50 participants including members of National Network, representatives of UNICEF, UNDP, Ministry of Labor and Social Welfare, Social Welfare Centers and media discussed main problems in implementation of the new Law on Social and Child Protection. Key speakers were Mrs. Biljana Zeković – Executive Director of the SOS Telephone for Women and Children Victims violencePodgorica, Mr. Predrag Boskovic – Minister of Labour and Social Welfare of Montenegro, Mr. Rastislav Vrbenski – UN Resident Coordinator and UNDP Resident Representative to Montenegro, Mr. Benjamin Perks – UNICEF Representative in Montenegro,and Mr. Igor Vucinic – Chief Directorate of risky groups, the Ministry of Labor and Social Welfare. Biljana Zeković, director of SOS Telephone Podgorica, Montenegro coordinator, opened round table introducing IRIS network and National Network of Montenegro.” Network consists of 30 credible organizations that deal with providing support to children,youth, the elderly, victims of domestic violence, persons with disabilities and migrants. Great interest of a large number of organizations and institutions for our Network speaks about the importance of this topic and how strong are the initiatives fornetworking and cooperation of all sectors” said Zekovic. In the opinion of Predrag Boskovic, Minister of Labor and Social Welfare of the Government of Montenegro, the Law on Social and Child Protection in Monetengro is better than the laws that apply in the region and that today the social and child protectionis improving each year. “If we want to have quality social and child protection in Montenegro, it is impossible to separate state responsibility and accountability of NGOs. In order to achieve the best results it is necessary that there is good communicationbetween them and based on that to identify problems and work together to resolve them” said Boskovic. Benjamin Perks, UNICEF Representative to Montenegro, thinks that reform of the social welfare system should include five steps. The first step is to reform the legal framework, the second is to strengthen the institutional framework, the third is to build the capacity of providers of social services, the fourth increase in the number of day care centers, until now there is only eight day care centers in municipalities of Montenegro and the fifth step is to change behavior and attitudes towards inclusion ofchildren with disabilities. He emphasized the enormous contribution of civil society to reform of social and child protection. Rastislav Vrbenski, UN Resident Coordinator and UNDP Resident Representative in Montenegro, said that a comprehensivereform of the social welfare is one of the key undertakings of the Government in the ongoing process of EU integration. In his opinion, the Ministry of Labor and Social Welfare is making great efforts to improve the legal and institutional pre-conditionsnecessary for the harmonization of international standards and best practices from the region and the European Union. Vrbenskisaid that the UNDP and UNICEF in this area will still provide ​​technical support with special emphasis on the development and adoption of a series of ordinances that need to: provide adequate implementation of the newly adopted Law on Social and Child Protection, the formation of the Institute for Social and child welfare, the establishment of the Directorate for the development of social and child protection. 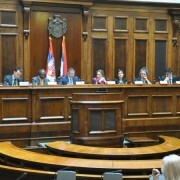 Public debate was held in National Assembly of the Republic of Serbia at Friday, 7th of March 2014. Main topic of discussion was “Perspectives on Sustainability of funding support to children and vulnerable groups beneficiaries of social services”. The debate was organized by member of IRIS Network “Educational Center” Leskovac, “Society for the Development of Children and Youth – Open Club” in collaboration with the Government Office for Cooperation with Civil Society. The aim of the conference was to encourage a consensus among decision-makers, experts and civil society around the needs of effective coordination and use of available local resources and future EU funds earmarked for social inclusion of vulnerable and marginalized groups. Public debate was opened by National Assembly Speaker Nebojsa Stefanovic, after which Mr Michel Saint-Lot, UNICEF Serbia Representative, greeted the present. Among the key speakers were: Gordan Velev, IRIS-regional networks of social service providers, Sasa Stojanovic – MODS Association for the Development of Children and Youth Outdoor Club, Brankica Jankovic, State Secretary, Ministry of Labor and Social Policy, Ivana Cirkovic, Director of the Government Office for Cooperation with NGOs, Marija Sijan, the Fund for the social inclusion of children, Zarko Šunderić, SIPRU Fund for Inclusion, Milena Banovic, Government Office for cooperation with Civil society organizations. Hall of the National Assembly was filled with around one hundred representatives of NGOs that deal with social service provision and over 20 journalists from different media houses from Serbia. Some of the most important and popular media informed public about the event, and we raised important questions about social services and child protection in wider public in Serbia. CSO representatives from all around the Serbia had chance to emphasize their biggest problems and concerns and also to ask questions to government representatives. Owing to the huge interest for this event and important topic we discussed, many people didn’t have a chance to participate. Because of that we had had live stream of the debate and also live twitter chat in which people could ask questions and give comments to speakers in the debate.